Editorial | Have You Seen This (X)man? Yes, I actually own this book. 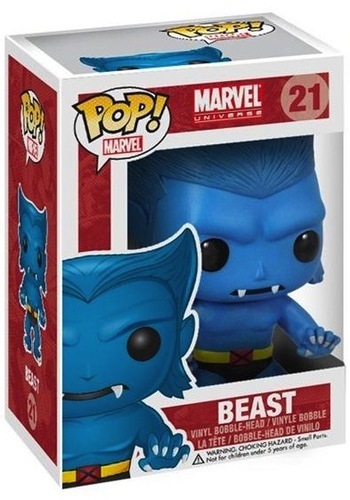 As many of my readers who regularly follow the blog know, I really love Marvel’s blue, furry X-man Beast. I’ve written poems about him, and even my local comic book store regularly puts aside issues in which he appears for me to pick up. Seriously, it doesn’t matter what the book is about, I will buy it if Beast is in it. About a year ago I decided that I wanted to find a Beast statue, so I enlisted Andrew to help me look. I had no idea what I was getting us both into. The first place I looked for Beast was, naturally, New York Comic Con. Conventions are often a great place to get hard to find collectible items. Lots of times comic book store owners will bring comics and collectibles that have been sitting in their stores for a long time, and they are willing to strike a bargain to avoid taking them home again. So I enthusiastically started at one end of the floor and headed toward the other. I have to be honest; I didn’t scour NYCC for a Beast statue. That was my first convention and I was pretty overwhelmed with the shiny things on both sides of me. Besides, how hard could it possibly be to find a statue of one of Marvel’s more popular characters? That was probably a poor choice of rhetorical questions. NYCC was a bust, but I was not yet discouraged. So the next stop was my local comic book stores. By the third or fourth store, I was getting a little tired. One shop had a Beast resin bust, but it wasn’t really what I was looking for. I really wanted a statue of X-man Beast—although I was willing to settle for the Avengers style Beast if I had to. Andrew did his best to console me by finding a Funko Pop Beast figure, which is adorable, but just whet my appetite even more for the statue I was so sure I was going to find. He’s awesome, even in Funko form! 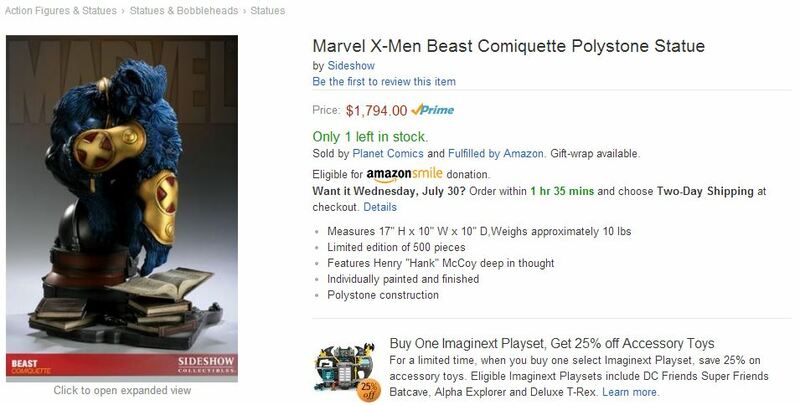 I researched online and realized that there have been very few statues of Beast ever made, which is surprising considering that he has been in several of the X-men movies. I finally found a limited edition statue online… for about $1800. By the end of May, I had been to three conventions and four comic book stores looking for my Beast, but with absolutely no luck. Andrew had been to all the same conventions, plus a couple more and promised to grab a statue if he found one, but even a trip to Emerald City Con in Seattle turned up nothing. Finally, I went to Phoenix Comicon and asked at every booth. Some of the proprietors vaguely remembered seeing a Beast figure, but no one could remember where. Finally, I came across a tiny stall filled with Marvel and DC action figures. I glanced around, but I didn’t immediately see what I was looking for and turned to leave, rather dejectedly. From behind me Andrew said excitedly, “Oh they have one!” I whipped around and sure enough, there was a Beast figurine hanging on the kiosk wall. I was so excited and shocked to actually find what I was looking for that my hands were shaking when I handed my money to the sweet lady who owned the stall. At least the shipping is free?